What a lot to do before my holiday. I have been lucky enough to be invited to stay in a french farmhouse, for free! It's in the middle of nowhere, but it does have a swimming pool. With 4 card and ATC swops, not to mention the 'buddies' swop, on the go I need to get organised. So I'm busy getting some things together so I can take my crafting with me. Luckily most of the cutting can be done before I leave, then I can sit in the sun and craft to my hearts content-bliss. Well, I'm hoping for sun!!! it can't be any worse than our summer. I may even go looking for a French craft shop, already been on the Web to check them out. 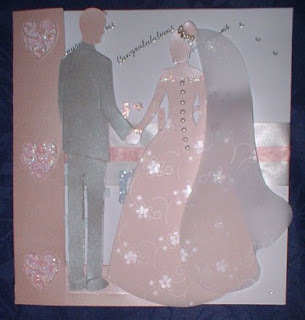 I have used my favourite pearlised card for the bride's dress and the side panel. The overdress dress and veil are cut from embossed vellum and some stickles have been added to the flower centres, collar and wrist. Pearly decorative gems are used on the buttons and tiara and I have added hidden wire to the couples arms and hands to strengthen them. The groom's suit is pearlised grey card, I added the left foot as it does not appear on the cartridge. 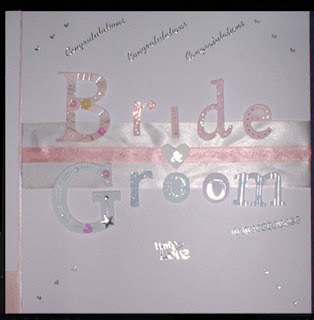 The inside is made up from peel off stickers, ribbon and decorated letters. The card measures 8.75 x 8.25 inches.